The name of our estate means ‘paradise’; we’re lucky enough to call it our office. The only way to do truly great work is to truly love what you do. 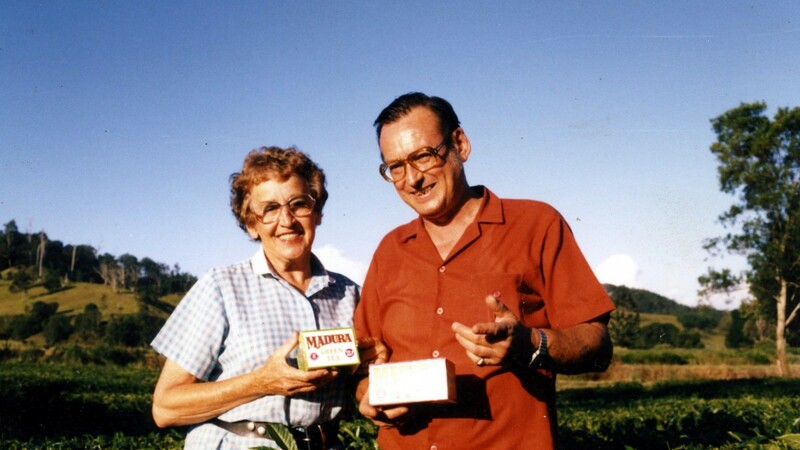 For us, it all started in 1978, when the pristine site for our office was handpicked by third-generation tea planters Michael and Norma Grant-Cook. Recognising the potential of the fertile oasis nestled in the heart of the Northern New South Wales hinterland, Michael and Norma began laying the foundations of Australia’s earliest sustainable tea plantations. Their vision was as crystal clear as the creek that carves its way through our estate: to produce the perfect brew blending Australian-grown tea with the finest hand-selected teas from around the world. Our office is more than just a plantation for creating award-winning tea though. The Grant-Cook legacy of purity and sustainability has endured and evolved, and we proudly work in harmony with our environment to nurture the delicate eco-system that supports us. We extend that sustainability to our local community, employing more than fifty staff – our Madura family – from the surrounding region. By the year 2000 our office was recognised as one of the Southern Hemisphere’s most advanced tea packing facilities. Our innovations in packaging helped cement our reputation for quality tea, awarded for freshness and flavour multiple times. Not to shabby an achievement from our humble beginnings back in the late seventies! Fast forward to today, and we’ve expanded our range to reflect the evolving tastes and trends of customers the world over. Our office may have grown, but we retain the same pioneering spirit and genuine love of tea that is the heartbeat of Madura. We are an Australian company and proud of it. Want to see for yourself why Madura means ‘paradise’ – we invite you to explore our office first hand. From our 250,000 tea plants, to our amazing packing facilities – our story will unfold around you as you take a walk through the beautiful sub-tropical backdrop of our heritage.